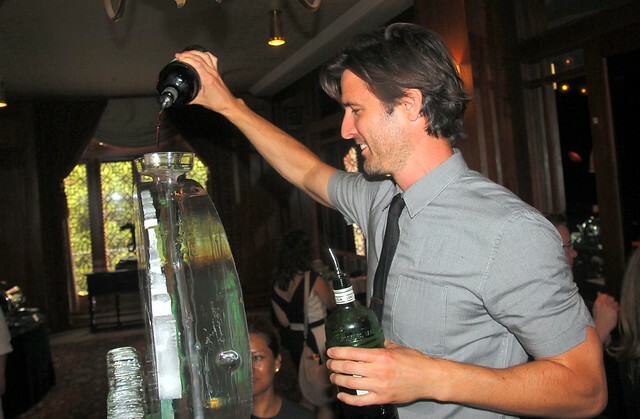 Bartender Garrett McKechnie and friend shaking their stuff at LA Athletic Club’s new bar, Invention. Last night, the members-only L.A. Athletic Club finally debuted its new third floor bar, Invention. For a century it was just a nameless bar that served booze to the LAAC members but as the cocktail scene emerged and grew in downtown L.A. that bar seemed more and more inadequate. People wanted to drink something good now, not just to whet their whistle. And that’s where Liquid Assets‘ cocktail consultants Aidan Demarest and Marcos Tello came in. 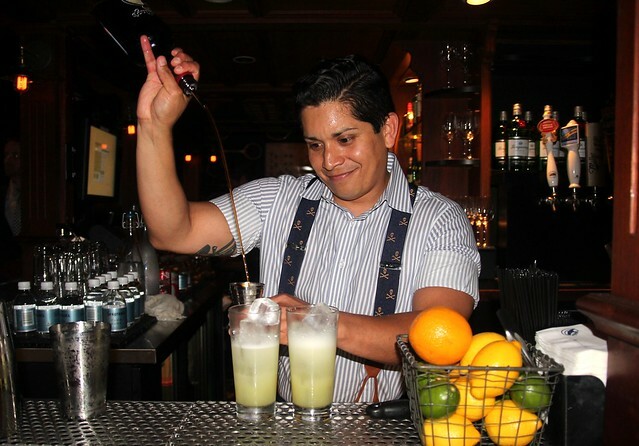 The two cocktalians are not only members of the LA Athletic Club but have had a hand in the success of downtown’s craft cocktail scene, having opened Cedd Moses’ Seven Grand together, worked at The Doheny, the Edison and First & Hope. Invention Bar & Lounge marks their return to DTLA. Hooray! 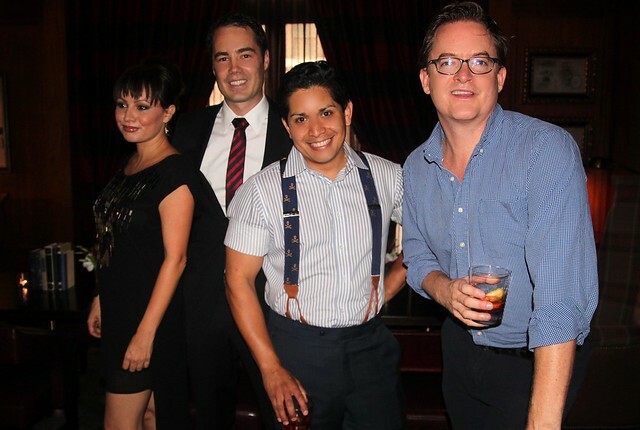 Last night Aidan and Marcos, along with the designer of Invention, Tracy Beckmann, and LAAC owner Cory Hathaway, welcomed club members as well as L.A. media to the grand opening of the bar. Marcos and bartender Garrett McKechnie served up drinks from the classic cocktail menu to the thirsty crowd. Well-made Last Words, Pegu Clubs, Southsides and more. 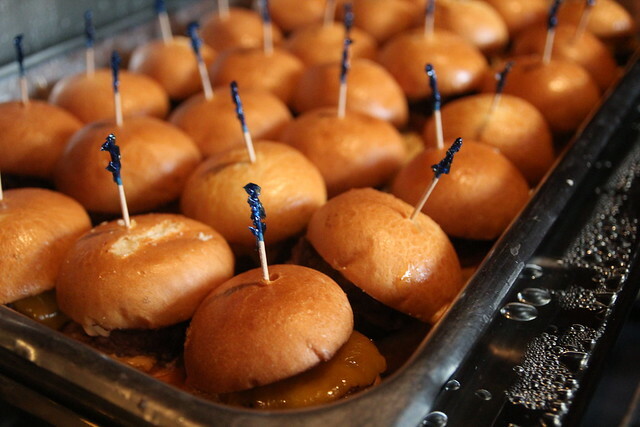 While Executive Chef Boris Chernyak set out a buffet of sliders, scallops and deviled eggs as well as takeout containers filled with buckwheat stir-fried noodles and vegetables. This third floor joint has definitely come a long way from its staid beginnings. Party guests lounged around in a beautifully put-together-space that designer Beckmann described decorated like “your rich uncle’s house”: masculine with a few feminine touches. It’s old world elegance without being too old, and hip without being too hip. Lots of seating areas where you can grab a couple of armchairs in the corner for you and a date or one of those big leather couches for you and your crew. For the first time, I wanted to join a club. Unfortunately, the monthly $169 membership fee is way beyond my budget as much as I love that indoor gym (especially the indoor track). But to celebrate the opening of Invention as well as Aidan and Marcos’ fourth floor bar, which is scheduled to open in six months, and the revamped second-floor Duke’s Sports Bar, the club created a new membership tier: Social membership for $80 a month. You get access to the club’s social amenities (not including the gym), that killer parking rate of three hours for $1.50 and discounted rates for partner hotels around the country. The price of the cocktails are not included in the membership fee but they are considerably cheaper than the usual downtown rate. Here, they’re $9 a piece and you don’t have to tip! Hmmm! As for the party, it was going off as club members filled out the room after 7pm. And the L.A. cocktail community turned out in full force to support Marcos and Aidan. 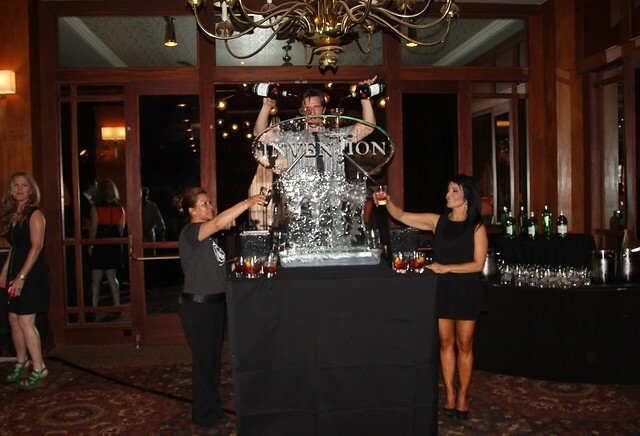 Bartenders, brand ambassadors and cocktail enthusiasts made use of their brief time in the private club. For many it was the first time they had ever set foot in there. And after last night’s party, I’m sure it won’t be the last time. Left to right: LAAC Invention’s designer Tracy Beckmann, owner Cory Hathaway and Liquid Assets’ Marcos Tello and Aidan Demarest. It ain’t an Aidan Demarest party without an ice sculpture. That’s one way to chill a Negroni. 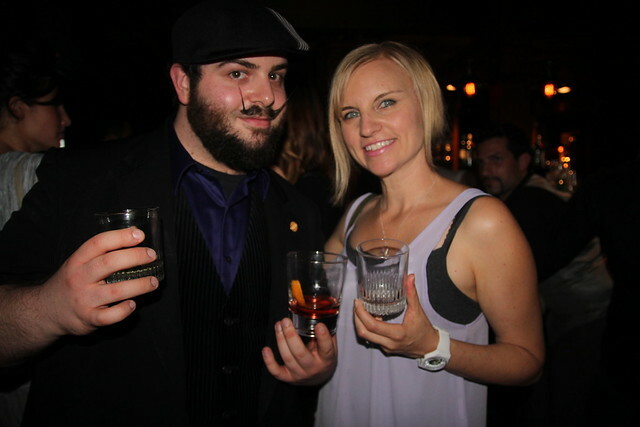 Bartender Jordan Gold and Southern Wine & Spirits’ Tricia Alley enjoying the festivities. Blogger EstarLA Esther Tseng and Bacardi’s Jaymee Mandeville. LAAC’s Executive Chef Boris Chernyak. 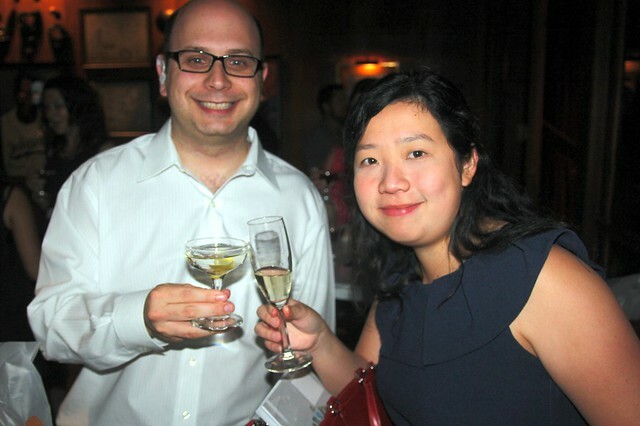 Bloggers Savory Hunter Aaron Tell and Gourmet Pigs Fiona Chandra cheers-ing. 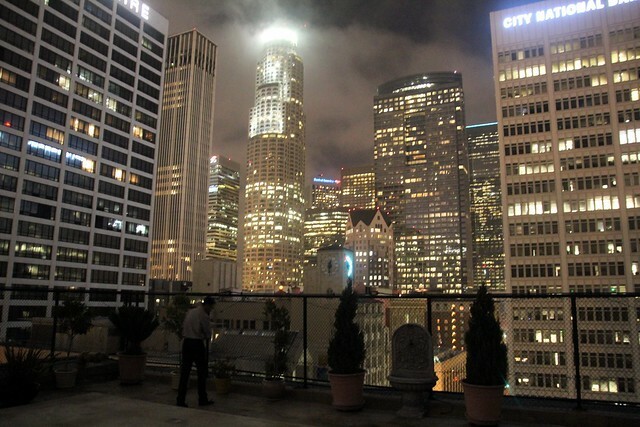 This view of LA skyline from LAAC’s roof is worth that membership fee, no? 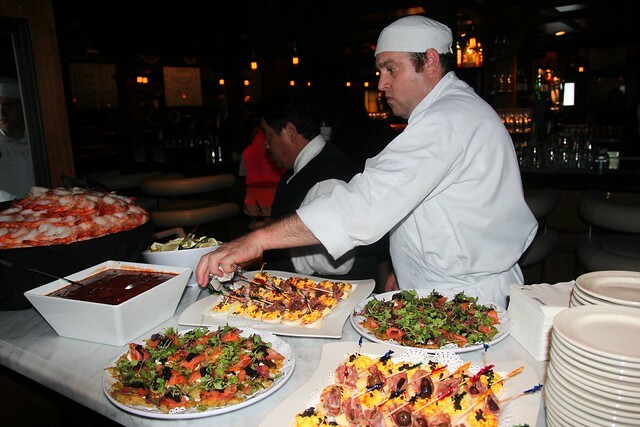 Food and drinks = yes! But that view of DTLA? LIKE! Yeah, it’s so gorgeous up there. Makes me love L.A. even more.